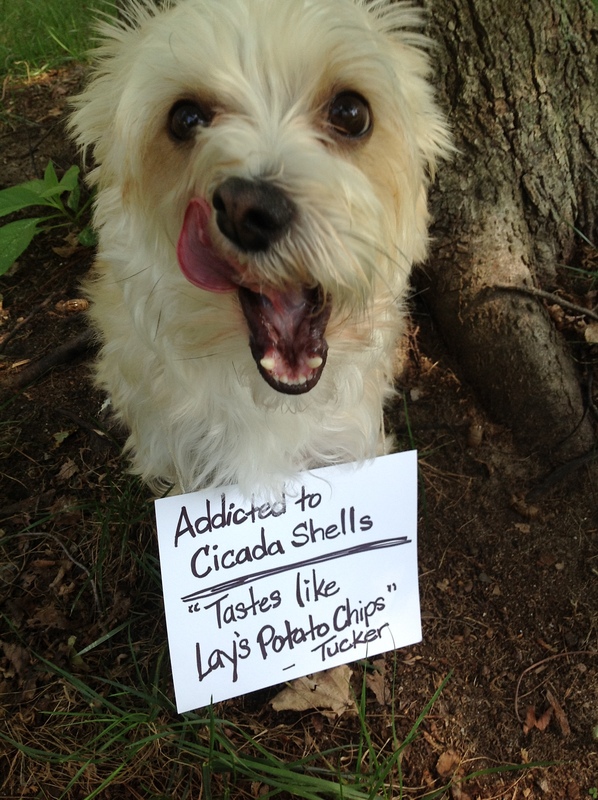 Poor Tucker is addicted to cicada shells . . can’t eat just one. Doesn’t look too ashamed about it though. Posted March 2nd, 2013 . My dog used to eat the cicadas off the ground, and then throw up the exoskeleton since it’s hard to digest…yuck, yuck, yuck…and it smelled like bug juice too, disgusting. I had a JRT, Patches, who would eat the live ones. She liked to hold them in her mouth, to feel them buzz. She once chased me around the yard with a big one in her mouth. When I finally got inside, I shut the door before she came inside with it. So she ate it. I was sooooo grossed out. Well…. supposedly they’re good protein…. a place in Missouri was making Cicada ice cream a few years back. My 15 year old toothless cat hunts them.